- This is an additional product of the tado° Starter Kits. You can add additional Smart Thermostats to your setup to control multiple rooms or zones independently from one another. - Control your heating with the tado° Smart Thermostat from everywhere and anytime - via app, tablet and PC. 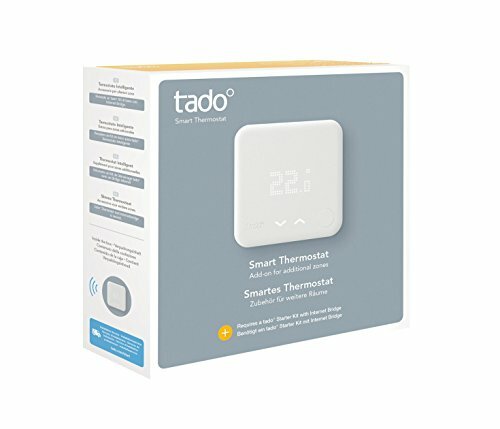 tado° pays for itself within the first. - Smart Home Integration - Amazon Alexa, Apple HomeKit, Google Assistant..: Control your heating with your voice or enable multiple Smart Home products and services to work in combination by creating scenes. - Works with 95% of heating systems. Can be used as a second zone thermostat. Box contains: Smart Thermostat, accessories. Requires the tado° Internet Bridge (included in all Starter Kits).